The Hasegawa School was founded by Hasegawa Tōhaku (1539-1610) in the late 16th century. Despite being small, consisting mostly of Tōhaku, his sons and sons-in-law, it is known today as one of the most influential artistic groups of the period. 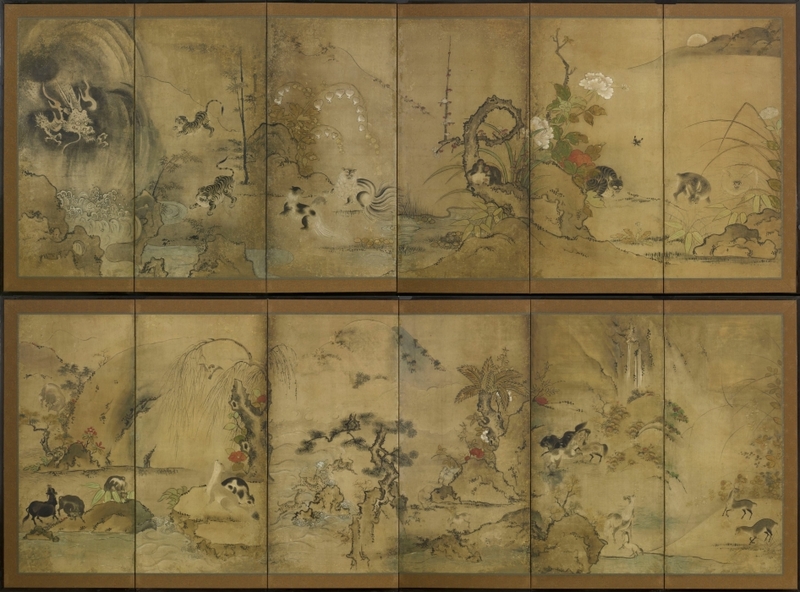 Its members conserved Tōhaku’s quiet and reserved aesthetic, which many attribute to the influence of Sesshū Tōyō (1420-1506) as well as his contemporary and friend, Sen no Rikyū (1522-1591). 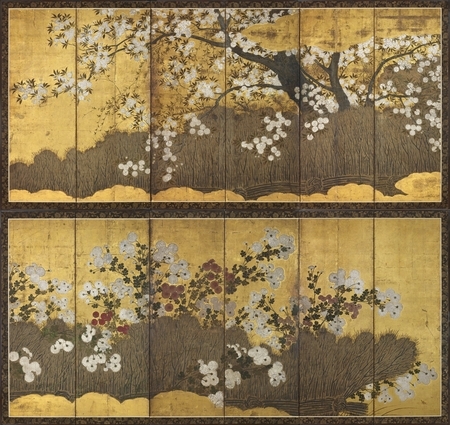 Cherry blossoms and chrysanthemums have been regarded as the flowers which represent Japan and its culture and have been depicted in many forms of Japanese art, each symbolising one of the four seasons. Japanese interest in cherry blossom and chrysanthemums as a theme for poetry developed during the Heian period (794-1185). At that time, along with the evolution of a native artistic sensibility heavily influenced by the passing seasons, the flowers gained their place as one of the premier symbols of spring and autumn. 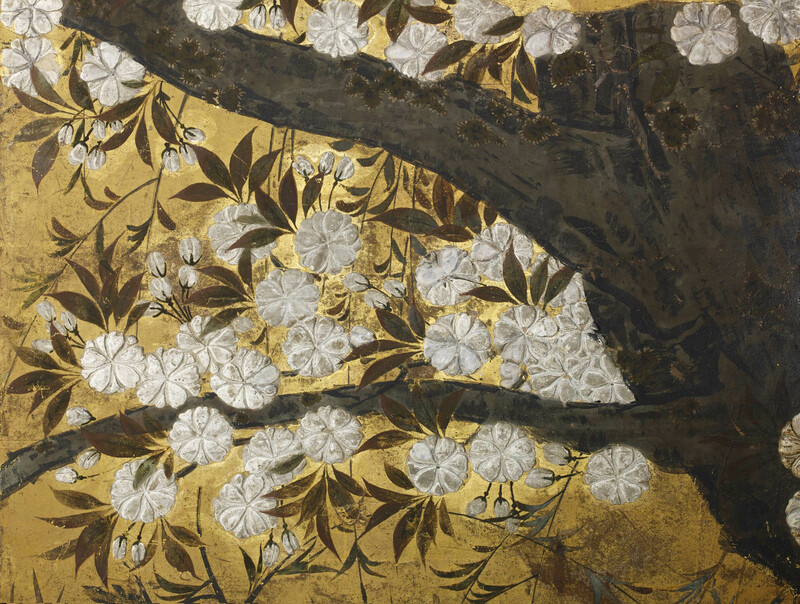 Since the Heian period, the cherry blossom or sakura has been revered by the Japanese, for its natural beauty and grace, its brief blossoming period and the fragility of its delicate flowers personifying the transience of life. The chrysanthemums or kiku were also cultivated as ornamentals in Japan from the Heian period while the plant’s medicinal qualities had been celebrated since the pre-Nara era (pre-710). The Edo period (1603-1868) saw a gardening boom. As a result of this enthusiasm in the early 17th century, various species of chrysanthemums were produced and flower shows for new types of chrysanthemums called kikuawase (chrysanthemum matching) gained great popularity among the people. The first use of the chrysanthemum as a symbol of the Japanese Emperor and the Imperial family occurred in the 13th century when Emperor Go-Daigo adopted the flower as a crest this tradition continues until the present day. In more recent times many commoners also used chrysanthemum as a family crest, and a Matsuya store catalogue of 1913 included 95 designs for crests based on this flower. SKU: 7525/7526. Categories: Screens, Six Fold. Tag: cherry blossom.